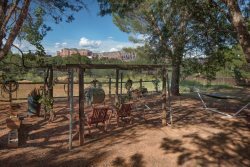 1 Condo has everything you need for a comfortable, enjoyable stay in Sedona. Guests will find that it is bright and cheerful with a great layout! It has a fireplace in the living room for curling up in the evening when there's a chill in the air. It is well equipped with kitchenware, linens, gas BBQ etc. Everything is turn Key. There is private patio for you to soak up the sun or enjoy the beautiful Arizona night skies. Nepenthe is a friendly, well maintained complex that attracts long term residents as well as vacationers. You can also enjoy the community spa and pool in a nice relaxed atmosphere, This Columbine Condo has all the comforts of home. Note: Garage is not included. Parking: Carport and extra guest parking. Garage is locked for owners use.